Home Forex Robots Eklatant Forex Robot Review – Scam? Strategy: The strategy of Eklatant Forex Robot is not known at this time, when I figured it out this will be updated. Not real vendor results Eklatant Forex Robot, it's better than nothing. Beware, this is not Myfxbook verified, so there is no promise the results are real. No customer accounts of Eklatant Forex Robot found. Don't bother with this one, waste of time and money. There are countless products on our site that would trade far safer than Eklatant Forex Robot. Is it a scam or not? We are not 100% sure. 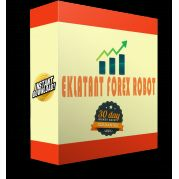 Do you have experience with Eklatant Forex Robot then feel free to select a score and leave a comment with your feedback. iS THAT STILL THE MATTER? Eklatant works well and has produced profit every day. However today (11/6/18) I awoke to see my account deactivated. Spoke with another user and he as well had the Eklatant EA deactivated. Their customer service was always poor but now fraud enters the picture. The EA is completely useless as they control if it runs or not. Eklatants website is gone for a week now and also the email adress.